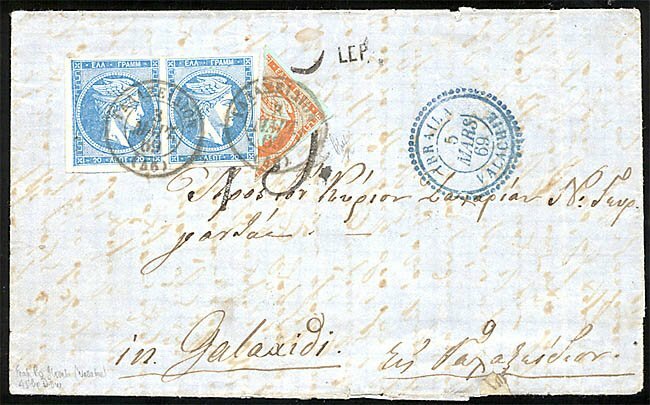 1869 EL canc.blue French IBRAILA-VALACHIE*5 MARS 69 (Romania) (stampless), trans.French CONSTANTINOPLE-TURQUIE, ΠΕΙΡΑΙΕΥΣ & ΑΘΗΝΑΙ, taxed with diagonally BISECTED 10l.orange/blue plus pair 20l.sky blue 1867/9 (Vl.31c+39) on arrival canc.ΓΑΛΑΞΕΙΔΙΟΝ (46)*3 ΜΑΡΤ.69. Handstamp. rate "45LEP". HOLCOMBE certific.1992) stating "an extremely rare bisect on cover from a rare office of sending".